Alex Marshall in Drama on 15 March, 2017. I feel I have to start by saying that this play is not for the feint at heart. 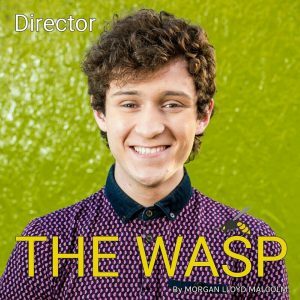 The Wasp for me personally ticks a lot of the boxes of my favourite kinds of play, generally speaking – It’s modern, it’s dark and it certainly keeps an audience on their toes. On top of this the play deals with some difficult and important issues such as the long term effects bullying and abuse can have on a person. I won’t hail it as a masterpiece of its time, or a flawless piece of writing, but it does what it does very well. It’s a psychological thriller at heart with enough twists in its tail to keep even the most placid of audience members on the edge of their seats. If you ask any of my cast and crew how you’d feel after watching it I’d bet on the answer being nearly unanimously ‘shook’. Being a cast of only two, the success of this play is so intrinsically dependent on the performances and chemistry of the actors, and I honestly could not be more delighted with Alex Hannant and Damson Young. Watching them both is an absolute delight – they completely click with their own characters and with each other. I think it’s fair to say certain events in the play push both of them to their limits, and perhaps the edge of what they’re comfortable with, and they have given this play everything I could have asked for and more. If you want to see two incredibly talented actors give two very different and challenging roles their all, then this is not something to miss. For me personally, I don’t have a better reason for wanting to put it on, or a better reason to come and see it than the simple fact that it’s hugely entertaining. Having seen it performed professionally in London I instantly bought the script knowing it was something I would like to do. It’s just genuinely an exciting piece of theatre. The plot is something of a roller-coaster, and the twists and turns will almost certainly keep you guessing, but on top of this there are some real comic moments that still have me laughing despite how many times I’ve seen them. We all know it’s that time of year. We’re busy, summatives and dissertations are due and everybody has a million and one plans before term ends. But for an hour and a bit come along to Cafédral and I can promise you an evening of genuinely stimulating theatre. And hey, if you don’t like the play there will be tea served for free, so come for that. Regardless, I sincerely hope to see you there.